Have you been reading the book news lately? It's not pretty. I feel like everyday I'm hearing about plummeting profits, massive lay-offs, book stores and libraries (!!) closing. We are living in dark and difficult book times. Shortly after BBAW (Book Blogger Appreciation Week), when I started to recover from that massive effort, my mind started working again...I thought...what if we could unite and energize this fantastic community of book bloggers and readers to make a conscious effort to "when possible, buy books" for the holidays. It would be a small contribution that we could make to show our appreciation to the people who bring us books, to give back to the industry that we love, and to help save books. Look, the economic times we are living in are not pretty. It's likely that a lot of us are going to be spending considerably less on gifts this year as it is and that we are feeling a little nervous about how we're going to manage. Let me sell you on the idea of giving books as gifts. Books are a good value for the amount they cost. They provide information, entertainment, encouragement, and escape. They challenge our thinking, make us laugh, and inspire our dreams. They look lovely sitting on our shelves or coffee tables. Books are diverse. I recognize that not everyone in your life might like to read. But thankfully, there's a book for just about every interest. There are even books that are just pictures or recipes...cool, huh??? Giving books makes you look intelligent and cool. Enough said. I could just send this idea out there and say...I hope you'll join in, but I want this to be a fun effort. I really want you to get into it and challenge yourself to find the right book for each person on your list. I believe it can be done. So, I asked a few people on Twitter and we set up a blog! Buy Books for the Holidays is a collaborative blog that will showcase books, serve as a central point where we can all report our progress, give bloggers a chance to showcase reviews by genre, help people find the perfect book for that difficult or challenging person on your list, announce internet or bookstore specials, and raise awareness of literacy charities to promote a culture of reading in the future. So here's my challenge to you....are you willing to buy books this holiday season? Not just for the usual suspects but for as many people on your list as possible? We have a lot of librarians and book clerks in the community so I'm pretty sure we can help each person find just the right book! Are you in? Of course, I want this to be a huge sweeping movement, but here's a little nudge to get us there...if we can get 100 people signed up, I'll donate 100 dollars to First Book. Sign up for the challenge and commit to buy books as your gifts this holiday season. Spread the word. We have a cute button you can use on your blog. Write about it on your blog. Email your friends. 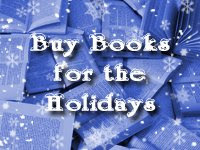 Twitter your heart out, tell others on facebook...GET THE WORD OUT to encourage others to buy books this holiday season. Subscribe to the feed. Don't miss a single post or request for help. Don't be shy about offering recommendations to others when they're looking for help. Look for posts that solicit your review links. Be active in helping others find the right books. Sounds like a great idea! Anything we can do to save the book and promote reading is a good thing. But what about gift cards? Since most of my Christmas giving has to be done long distance (very long, in some cases), I'm much more likely to be sending bookstore gift cards, rather than actual books. And in general, I think I'd rather receive a gift card myself, so I can do the choosing. Amy, you're so sweet and I think your heart is in the right place, but I'm with JLS Hall about gift cards. Unless I knew exactly what the person wanted (or could make a reasonable guess) I wouldn't buy them a book. I would, however, buy a gift card (and that's what I would prefer to receive, too). Plus they are much easier and cheaper to ship. Plus many (most!) of the people on my list are not readers, sadly. I can't buy books exclusively because I've got some non-readers on my list. I did buy 2 books for a Halloween gift and I bought 2 books this weekend - 1 for me and 1 for my mother-in-law. I think this campaign is wonderful, though. I LOVE this idea! I'm off to go sign up. Part of the idea of this is to help each other find books for even people who don't read. Gift cards are good, especially to a bookstore, but not quite as good since many other things may be purchased there. Great idea, especially during these times when budgets are trimmed and more people are staying home. It's nice to have books available to curl up with, beneath a throw, to enjoy over the winter at home. This is so awesome! I've posted this and the new blog on our site. Well I'll definitely be GIVING books for Christmas but not much in the way of buying. I'll be passing on my ARCs and using my accumlated amazon gift certificates to order some other books. I've signed up, but my dad will be a tough one since I've bought him books and he has yet to read them...maybe this year will be audiobook year for him. I am loving this! As a teacher, I always try to convince my students' parents to give books as holiday gifts, too. Also, if you need any help, I am a kidlit blogger who would love to be involved! I LOVE the idea of an audio book! Wonderful idea Amy! I buy books for my nieces and nephews for their birthdays every year. I have a box full of books that I keep stocked for birthdays. I already have their Christmas gifts so, I can't commit to buying books for the holidays. Just wanted to say 'Great idea!' and share that I do it all year for birthdays. Yup! I am in! I use every holiday as an excuse for buying books. My kids get books for Christmas, Valentine's Day, Easter, their birthdays, and even on the last day of school each summer.... I love giving books to people. Great idea and so simple. Amy, I've posted the picture in my sidebar with a link to this post. I hope that's the "idea". I'd tell you I'd post the "I'm buying books" campaign, but I've pretty much got my shopping done. You really got me thinking. I posted a link to your page, and just wrote a little bit about favorite holiday books.